Below we will share with you the answers to the most frequently asked questions we get from our customers in the hope that they will help you make an informed decision regarding personal loans. 1. How much can I borrow as a first time customer? This decision is up to you and the needs you have. With a personal loan from 36MonthLoans.com you can borrow from $1,000 to $25,000*. However, the approval of a loan will be entirely up to the lender you are matched with. The lender will analyze your application and they will make you a lower offer with the amount they consider you can afford to pay back, if the details in your application can't sustain the amount you asked for in the first place. Lending decisions will be based on several factors, including, but not limited to, credit history, employment history, and loan repayment history. *All loans subject to lender's credit policies. Rates will vary based on your credit, loan size and whether the loan is unsecured or a collateral is provided, with the lowest rates available to customers with good credit on larger, secured loans. Minimum and maximum loan amounts and APR may vary according to state law. 2. What is the minimum score I can apply with? A good baseline for a credit score with our lenders is around 540. However, that will not necessarily guarantee an acceptance. Some of our lenders service below this value, but if matched with a lender, your credit score will also influence the APR that the lender will offer you for a loan. All the data in your application will influence our lenders’ decision for pre-approval. 3. Does 36monthloans.com run credit checks? 36monthloans.com does not run credit checks. Our lenders try to do as many internal checks as possible prior to checking for a credit score. However, if this is necessary, a soft or hard pull will be performed by the lender you are matched with. Your credit score will not be checked more than once. 4. Is my personal information secure if I submit an application through your process? Yes, your information is secure with us. Our system is using several bank secure systems that encrypt your information. We also have an article on the website where you can find out more information about this issue, "Safe and Secured Environment". 5. Is this website safe/legit? Yes, 36MonthLoans.com is a legitimate website and we are accredited by the BBB (Better Business Bureau). We also have their seal on our website, which states that we are accredited. Our website is safe and secure. We are using a "https" code at the beginning of the URL in the browser, which is the first sign that a website is secured by clicking on the lock next to it you can see that we are verified by Go Daddy SSL Certificate. After finishing the application, you will have an answer in less than a minute right there on the website if we were able to match you with one of our lenders. If that is so, then you will be redirected to your lender’s page. If you agree with all the terms & conditions they offer you, then you can sign the agreement. Once you have been approved for a loan and you have reviewed the terms of the lender you were matched with, the funds will be either wired to your bank account in the shortest amount of time, or, for some personal loan providers, you will be required to pick up the loan directly from the closest local branch. The approval process may take 4-8 hours. 7. How much do I have to pay monthly? All information regarding your loan, including your APR, is strictly between you and the lender you are matched with and will only be available once you are matched with the lender and redirected to their page. The lender will make their terms and conditions clear, including monthly payments and the amount you will need to repay. We always advise customers to read carefully the terms and conditions presented to them once they are matched and make sure they understand the rates as well as the repayment terms before accepting. 8. How do I pay back the loan? We believe loan repayments should be as simple and hassle-free as possible. 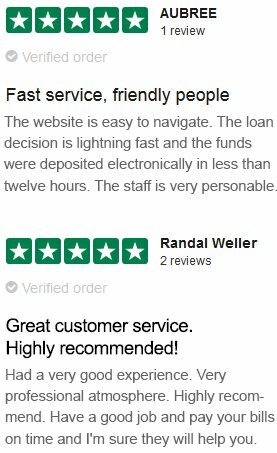 That is why the lenders we work with have easy online portals where you can make your payments online and manage your account. If you prefer, there are also friendly customer service agents that can take your payment directly on the phone. Specifically, the repayment of a personal loan is a very simple process and works through an automatic payment option known as Electronic Fund Transfer. This means that on the due date, the payment is simply withdrawn from your bank account. Now you have nothing to worry about when it comes to late payments. Usually the payments are set either monthly or fortnightly, but other payment options may be available. To benefit from these options you will need to call the lender directly. 9. Can payments be made before the due date? Yes, early payments can be made without any early payment penalties. We believe it is very important that our customers have the flexibility needed to make the payments but still sustain a healthy financial situation. Repayment flexibility also consists in scheduled repayment plans and the option to pay the loan in full at any time. If you choose to pay the loan in full before the due date you will only need to pay the interest rate for the amount you have outstanding at that time. None of the lenders we work with have early payment penalties. 10. What happens if I miss a payment or default on my loan? Here at 36MonthLoans.com your financial stability is most important to us. If you feel you can’t make your next payment you should call the lender you got matched with directly. Their customer support team may offer a courtesy due date. This way you can get some extra time to make the payment. In case you have already missed a payment you should contact the lender’s Payment Planning Team where you will get the help needed to get back on track with the payments or even make a payment arrangement based on your budget. The most important step to take if you miss a payment or default on your loan is to call the lender immediately. 11. What is the interest you practice for loans? / How does the lender establish the interest? All information regarding your loan, including your APR, is strictly between you and the lender you are matched with. The APR rates will vary based on your credit, loan size and whether the loan is unsecured or a collateral is provided, with the lowest rates available to customers with good credit on larger, secured loans. Minimum and maximum loan amounts and APR may vary according to state law. 12. Can I apply with a co applicant/co signer? Yes, if necessary our main lenders accept co-applicants. 13. What fees do I have to be aware of? The lenders we work with do not have any hidden fees, membership fees, upfront fees or prepayment penalties however origination and documentation fees may be included in certain states for some lenders. All this will be presented to you in your loan agreement if you are eligible to receive a loan. 14. Is 36MonthLoans.com a direct lender? 36MonthLoans.com is a loan matching service. We charge you no fee for our service. We are the bridge between consumers that need a medium to long term financial solution and the lenders themselves. Our simple online application process is designed to match you with the lender from our panel best able to suit your financial needs. 15. What are the top reasons why people take out a personal loan?